Every month, a Food, Nutrition, & Science Newsletter is published by The Lempert Report. One of their monthly features is a Q&A with a farmer, which I was fortunate enough to be the subject of last month. 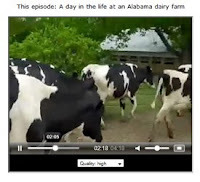 This month they have added a video feature in which a farmer walks the audience through a typical day on his or her farm. And, you guessed it, I'm the lucky guy this month. I hope you'll check out my Q&A and video, and I encourage you to subscribe to the newsletter so you can learn about new farmers every month! What to make of the Peterson video?